WHBQ RADIO (AM 560) - Founded by Gordon Lawhead and owner of Memphis radio station (telephone: Jackson 6-5456), located in Lobby of the Chisca Hotel at 272 South Main Street across Beale Street, is one of the city's key stations in the 1950s. The station's bestknown disc jockey, the manic Dewey Phillips, hosted the "Red Hot and Blue" show, essential listening for Memphis' first generation of rock and roll aspirants. On July 8, 1954, Sun Records' Sam Phillips handed Dewey (no relation) a test pressing of Elvis Presley's first single, "That's All Right". The disc jockey was so impressed he yelled, "Degawwhhh, it's a hit, it's a cotton pickin' hit! ", right on air. Within minutes the switchboard was jammed, and he began playing the track over and over while desperately trying to get Elvis Presley in for an interview. Eventually the singer was found at a local Suzure II cinema and whisked into the studio. Once Presley became a star, Dewey Phillips began calling everybody, including himself, Elvis - he'd even call up Atlantic Records VP Jerry Wexler and say, "Hi Elvis, this is Elvis". When Wexler and co-executive Ahmet Ertegun popped into the station one day in 1956 to plug records, Dewey told listeners he had a "couple of Yankee records thieves" with him. But after the show, he took the pair to meet Presley at a now-demolished club, where they unsuccessfully tried to buy out the future King's contract from Sun. Atlantic offered $30.000, which they could barely afford, but lost out to RCA Victor, which bid an extra $10.000. Elvis Presley didn't sing at the club that night, but Ertegun got up and did an impromptu version of Muddy Waters' "Hoochie Coochie Man", which won over a sceptical Dewey Phillips to Atlantic's cause and convinced him to play the labels' New York records on WHBQ radio. From the moment Dewey's life was intertwined with the rising career of Elvis Presley. Elvis joined him on the air several times, though every appearance was fraught with security problems. Once Dewey announced that Elvis Presley and the band were tuning up inside the radio station. Soon a crowd of teenagers rushed through the hotel entrance and up the stairs to the radio station on the mezzanine floor. Only a glass wall separated the musicians from the excited crowd, and the police were called to restore order. Elvis Presley and the band had to escape through a back exit. Situated at the corner of Linden Avenue and South Main Street, the Hotel Chisca had two entrances. The disc jockey’s and musicians preferred to use the Linden Avenue, or side entrance, into the hotel lobby. They would walk up a flight of stairs to the mezzanine floor, turn left down the hallway, and walk through the two glass doors into the station. In the back left portion of the station was Dewey's small room, filled with records and the endangered equipment. The room usually was crowded during show time because of Dewey's large entourage. Visitors to Dewey's show would also gather at the gravel parking lot across Linden Avenue (now part of the Memphis Light Gas and Water Building). Radio station WHBQ moved and now based in the suburbs to a new facility at 462 South Highland in 1962, the station features sports and talk, having abandoned music after disc jockey Rick Dees assaulted the pop world with his 1976 single, "Disco Duck". Today George Klein hosts his Elvis Hour radio show on WHBQ radio. CHISCA HOTEL – Built in 1913 and located at 272 South Main Street, Memphis, across Beale Street, Sam Phillips delivered demos to key Memphis disc jockey’s: including Dewey Phillips at WHBQ radio. In 1954, the Chisca Hotel was home to radio station WHBQ and disc jockey Dewey Phillips' program "Red Hot And Blue". Phillips often played new releases from friend and business associate Sam Phillips' record label, Sun Records. On July 8, 1954, Dewey Phillips played SUN 209 over the airways, making him one of the first disc jockey’s to spin a professionally recorded Elvis Presley toward stardom. He was so impressed with Elvis Presley's sound that he played "That's All Right" and the flip side, "Blue Moon Of Kentucky", repeatedly throughout his show. The response to Elvis Presley was overwhelmingly positive. Dewey Phillips wanted Elvis Presley to come in that night for his first radio interview. Sam Phillips called the Presley's at their Alabama Street apartment, but Elvis Presley was no where to be found. Vernon Presley hunted him down, finding him hiding at the movie theater, Suzore II at 279 North Main Street, because he was too afraid to listen to himself on WHBQ radio. That night Elvis Presley went to the Chisca Hotel where he was interviewed by Dewey Phillips. During the interview Phillips asked Elvis Presley which high school he attended. The racial climate at the time was so tense, and Elvis' sound so different from that of other white artists, that his racial background was unclear. Elvis Presley's response of "Humes High School, sir", affirmed to listeners that he was white. Today, the stately Chisca Hotel still stands at the southwest corner of Main Street and Linden Avenue, and used as the headquarters of a church with the name "Church Of God In Christ", and is not open to the public. On October 2012, the property appears to be on the verge of being saved. The private group has closed on the real estate contract purchasing the Hotel Chiska. It is expected renovation activity may begin during the summer of 2013. On August 7, 2012, the Memphis City Council voted to conditionally provide $3-million toward the restoration of Hotel Chisca. An investment group reportedly now will proceed with the purchase. Thew group still must provide/obtain private funding for the purchase and millions in restoration costs. DEWEY MILLS PHILLIPS - Memphis disc jockey for 56 WHBQ radio, located at 272 South Main, Memphis, Tennessee, who on his program "Red Hot and Blue", on July 8, 1954, first played an Elvis Presley song on radio. (Dewey Phillips was not only one of the first disc jockey to play an Elvis Presley record, he was the first disc jockey to play a Sun Record, when on March 1, 1952, he aired the first record released commercially by Sun Records. The record was "Blues In My Condition"/ "Sellin' My Whisky", SUN 174 by Jackie Boy and Little Walter). Born on May 13, 1926 in Crump, Tennessee, Dewey Phillips grew up in the small town of Adamsville, Tennessee, and moved to Memphis following a stint in the Army with nothing but a vague ambition to be a singer. A misfit at most jobs (he was fired from a bakery for convincing his co-workers to shape the loaves of bread like gingerbread men). Lived at 1232 Rutland Avenue during the height of his popularity, Dewey Phillips found his element on Beale Street, the heart of the black community and proving grounds for dozens of rising blues and jazz artists. He was the rare white person who felt comfortable haunting those clubs in that area, but then, "Dewey had no colore", said Beale Street entertainer and Stax recording star Rufus Thomas. In 1948, seeking an entree into the music business, Dewey Phillips got a job hawking recorded at Grant's, a department store in downtown Memphis. He immediately began blasting rhythm and blues through loudspeakers onto Main Street, then plugged a microphone onto the record player and started blasting himself. He soon had the hottest record department in the 500-store chain and had become his own brand of disc jockey. All he needed was a radio station. At the same time, another breakthrough had occurred in Memphis. WDIA, a small, dawn to dusk radio station on the verge of bankruptcy, had gone to all-black programming. It was the first station in the country and it was a spectacular success. It was a new kind of radio. Instead of the polish and impeccable diction expected of radio announcers of the era, disc jockey’s like Rufus Thomas and B.B. King brought a style of entertaining honed not in announcing schools but on the stage of Beale Street and country minstrel shows. They sold jokes, one-upped each other of the air and even talked over the music, if only because the lyrics of so many blues records were considered too lewd for radio. To its competitors, the only thing more shocking than WDIA's style were its profits, and they yearned for a piece of the action. Still unwilling to take the drastic step of hiring a black announcer, WHBQ radio decided to put on a rhythm and blues show called "Red Hot and Blue" as soon as WDIA radio went off the air at sunset hoping the music alone would draw the black audience. But hosted by a schooled, baritone-voiced announcer who knew nothing about the music he was playing, the show flopped. Apprehensively, but aware of his success at Grant's, the station gave Dewey Phillips a shot at hosting in October, 1949, and in less than a year the show grew from 15 minutes to an hour; then two; then three. Broadcasting from the magazine level (i.e. mezzanine of the Chisca Hotel, his signature was a manic, machine-gun style of speaking that made few concessions to proper English. "Dreegaw", he would yelp, and no one cared what it meant. If the jocks at WDIA radio talked over records to disguise lewd lyrics, Dewey Phillips did it just because it was fun. If he mispronounced his sponsor's names, that was fine. The customers came, with Dewey Phillips' trademark on their lips: "Phillips sent me". But while the local newspapers delighted in the story of the white disc jockey and his appeal to black listeners (they reported people even showing up at the hospital emergency room saying, "Phillips sent me"), something more was happening. White listeners were tuning in, too. One was a struggling record producer with the same passion for rhythm and blues: Sam Phillips. Although not related, the two struck up a fast and mutually beneficial friendship. Dewey Phillips had a "platinum ear", Sam Phillips thought, an uncanny knack for picking hits, and "Red Hot and Blue" became his personal test market, debuting the records of Howlin' Wolf, B.B. King, and other then-obscure artists Sam Phillips was recording in his small Memphis studio. In July 1954, Sam Phillips showed up with a record unusual even by his standards. It wasn't rhythm and blues. It wasn't country. It wasn't pop. It was Elvis Presley. Dewey Phillips played "That's All Right" on his show, and the world has never been the same. Phillips was so taken by the record that he played "That's All Right" fourteen times during the show. According to fellow WHBQ radio disc jockey, Wink Martindale, "Phillips played both sides of the 78rpm acetate, flipping it over the entire evening. Later that night, after receiving fourteen telegrams and forty-seven phone calls, Dewey Phillips interviewed Elvis, Elvis' first media interview. When Elvis Presley protested that he knew nothing about being interviewed, Dewey's simple advice was, "Just don't say nothing' dirty". Dewey Phillips and Elvis Presley, too, became fast friends. Dewey bought Elvis his first touring car, a $450 1941 Lincoln, but turned down an offer to manage him. His business of breaking new records was still not finished. It was Dewey Phillips who often "broke" Sam Phillips' latest releases over the air in Memphis. Dewey and Sam's friendship went back to 1950, when the two men launched their own record label, Phillips Records, billed as "The Hottest Thing In The Country". Singer Carl Perkins has said that Dewey may have been the first to use the expression, "Man, they're rockin' country music, they're rockabillies". In the next few years, Dewey would debut dozens of historic recordings coming out of Sam Phillips' Sun Records, including Carl Perkins' "Blue Suede Shoes" (SUN 234), Johnny Cash's "Folsom Prison Blues" (SUN 232), and Jerry Lee Lewis' "Whole Lotta Shakin' Goin' On" (SUN 267). 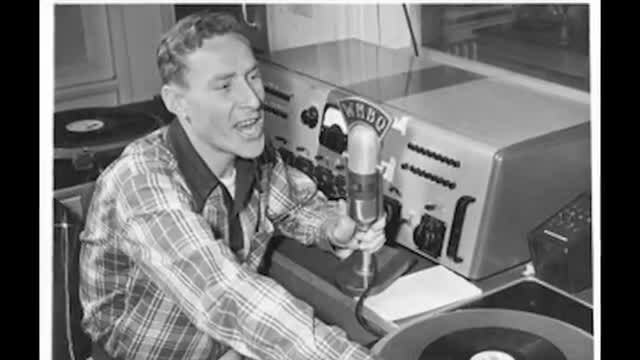 Of course, it was Dewey Phillips who played the first Jerry Lee Lewis record over the air on WHBQ radio in 1956, when he played "Crazy Arms" (SUN 259). Even more importantly, listening to Dewey Phillips had become almost a rite of passage for Memphis teenagers, black and white. The integrated bands who would make the hits at Stax, Hi and American studios in the 1960s and 1970s had their ears trained listening to Dewey Phillips in the 1950s, often in the parking lot of a supermarket, dancing in the headlights of their cars. Whenever you were, Dewey made it a party. In 1956, WHBQ radio decided to try Dewey on television, initially following Lawrence Welk. "You better warn those Welk listeners to grab that dial quick", he said, "because if they don't, I'll be right there at 'em". With his sidekick, Harry Fritzius, an eccentric art student who did the show in a trench coat and gorilla mask, Dewey Phillips' "Pop Shop" was a huge success. It was simulcast with his radio show, and because radio and tv broke at different times for different commercials, Dewey was never sure if he was on one or the other or both. No matter, "You really couldn't make a mistake on the show", a crew member said, "The whole show was a series of mistakes". Early in his career, WHBQ radio resorted to hiring "babysitters" for Dewey, just to protect their studio. "He was not physically well organized", a colleague remembered kindly. He dropped the needle on records and slobbered on the microphone. He eventually proved so abusive to the equipment that they gave him his own studio. But even as Dewey Phillips reached his peak, the future was closing in on him. Perhaps he had his first inkling when he saw Elvis Presley singing on the Steve Allen show in a tuxedo. "What are you doing in that monkey suit, boy? Where's your guitar? ", he scolded. Rock and roll was here to stay, all the more reason but to leave it in the hands of outrageous, untamable disc jockey’s. The future was called Top 40, with its pre-ordained play lists handed down from on high. Dewey Phillips and Elvis Presley had a falling-out in 1956, when on a visit to Elvis' house Dewey picket up the test acetate of "Hound Dog", which RCA Records, Elvis' label, hand't yet released. Phillips proceeded to feature the unreleased song on his radio show and on his new TV show as "way beyond Ernie Kovacs" in terms of cuttingedge TV comedy. It would be years before Elvis Presley forgave Dewey for stealing the record. old friends. Most veterans of the Memphis music industry have a collection of Dewey-in-decline stories, of bailing him out of jail or picking him up in various hospitals, where he'd often go in futile attempts to obtain drugs. His last job was in Millington, Tennessee, at a small station in a small Navy town a few miles north of Memphis. On a Saturday afternoon, Dewey Mills Phillips died of pneumonia on September 28, 1968, in bed at his mother's house in Memphis, at the age of forty-two. Elvis Presley attended Phillips' funeral, where he embarrassingly broke into a fit of nervous giggles. The next day on September 29, 1968, the local newspaper published an article by James Kingsley about the death of Dewey Phillips with headliner: DEWEY PHILLIPS IS FOUND DEAD. Disc jockey who launched Presley, Cash Careers Was 42. One of the nation's most influential disc jockey’s who launched the careers of Elvis Presley, Johnny Cash, Jerry Lee Lewis and Carl Perkins in the 1950s, was found dead in his bed yesterday. me in my career in the early days". Mr. Phillips' broadcast over radio station WHBQ was the "Red Hot and Blue Show", one of the biggest in the South and a major influence in launching careers of numerous recording stars. He played Elvis' first recording "That's All Right" and "Blue Moon Of Kentucky" one night in early 1954. Elvis had gone to a movie afraid to hear the recording on radio for the first time. ''I was scared to death. I was shaking all over when I heard what had happened. I just couldn't believe it but Dewey kept telling me to 'cool it'. It was really happening", Elvis recalled last night. "He was top dog", recalls Rufus Thomas. "There was none before him and there was none after. Dewey was the only white disc jockey doing black music. I believe he was doing it before". "He had the best ear for putting things together", Sam Phillips recall. "That type of thing had no format and that was the beauty of it. You never knew what to expect from Dewey. I am real careful about saying anything is unique. But Dewey was as close a thing to being unique in this profession as anybody". "Somebody like that guy Dewey Phillips comes along that is absolutely not supposed to make it in quote-unquote communications... He doesn't talk right; he doesn't do this right; he doesn't do that right; he's not conventional", Sam Phillips continued. "But, he makes it! And he makes it bigger than anybody who's ever been a disc jockey in this city. It's a damn fact! ".